Christian colleges give students the opportunity to earn a higher education in an environment focused on faith. For years, students have earned degrees on campus while going to church and participating in religious activities with their peers. And while these on-campus activities continue, many Christian colleges have moved academics online, providing a wide range of degree programs and courses to both undergraduate and graduate students. Some have even extended religious support and interaction to the web, allowing their online students to discuss their faith with fellow classmates, even if they're not on a campus. The following schools offer the full package: a Christian ethos, affordable tuition, full online programs, and a number of student support services that help shape cost-effective, quality learning at the college level. 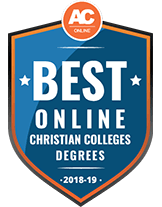 In other words, they belong to an exclusive list: The Best Online Christian Colleges for 2018-2019. The largest institution in Virginia, Liberty University boasts over 550 degree programs founded on Christian values. Christian values extend to their online campus where students have plenty of undergraduate programs to pick from. Ranging from unique programs like aviation to more common programs like education, their online school has options for students of all interests and backgrounds. Liberty University also offers three online programs through their divinity program: bachelor's degrees in Biblical education, leadership and religion. On top of their wide-ranging degree programs, Liberty makes it easy for students to earn their degree online. Courses are offered in nontraditional eight-week formats, letting students jump in and out of their studies as their schedules allow. Online tuition at Liberty hasn't increase in three years. Transfer students are also welcome and can bring up to 75 percent of their previously earned credits to the online school, reducing the cost and time it takes to earn a degree. Brigham Young University-Idaho is one of the largest private, Christian institutions with over 34,000 students on campus and another 15,000 online. One reason their online program is so popular is the flexibility it offers to students. Along with studying toward their bachelor's degree, students are able to earn a certificate and associate degree, all within the usual 4-year period it would take to earn a bachelor's degree. Regardless of how students choose to supplement their education, they'll end up earning one of BYUI's 9 bachelor's degrees. Prior to entering the online school, students will need to have completed a program called PathwayConnect, a 3-semester program that can be completed entirely online in just 1 year. If students have previously earned 15 or more on campus credits from a Church of Jesus Christ of Latter-Day Saints college, they can avoid the PathwayConnect program entirely and begin their studies immediately. Mount Vernon Nazarene University educates the whole person by combining higher education with Christian education. Its programs, including online programs, are structured to teach students how to be better leaders, learners and independent thinkers while also bringing in a religious element. Students that are interested in earning a bachelor's degree online from Mount Vernon Nazarene should have previous credit prior to applying. All of their online bachelor's degree programs are degree completion and require a minimum of 56 transferable credits. These can be earned by studying toward a degree at another institution or through a relevant associate degree program. For students that don't have enough credits, MVNU recommends earning an MVNU associate degree in general studies first. For online students interested in a degree in religion, the best option is the bachelor's in ministry leadership. It's a 40-credit-hour, degree-completion program that teaches students how to become better leaders in their local communities. What was once Kansas Bible College is now Manhattan Christian College, a private, Christian school that focuses solely on educating students in religion. However, as the school has grown, it's expanded to include an online department, which offers one of the college's only nonreligious degrees. Students who want a bachelor's degree from MCC have 2 online options: the bachelor's in Biblical leadership and the bachelor's in management and ethics. The latter, which is also their most popular online program, still places an emphasis on Christianity through the ethics and leadership of business. Both of these programs are degree completion, so students should have prior college credit before applying. Once in the program, students will take 4 courses each semester. This is broken down into 2 8-week courses, followed by another 2 8-week courses to make up a 16-week semester. Including prior credits, students should expect to earn their degree in 4 years. With roots in Catholicism, Rosemont College is a small school with just over 500 undergraduate students. With such a small student body, Rosemont is able to pay special attention to each student, ensuring that they're getting the best education possible. Even students pursuing an online program receive the same attention and quality education that on-campus students receive. If students are interested in studying entirely online at Rosemont, they'll only have one undergraduate degree option- the bachelor's in criminal justice. This 120-credit degree is taught through unique 5-week courses, allowing students to quickly earn college credits. Rosemont's online programs are all accelerated, too, so students can easily earn their degree in less than the traditional 4-year period. Transfer students can complete the bachelor's in criminal justice even faster since Rosemont allows them to bring in up to 84 credits. This reduces the cost even further, making this an affordable option for online transfer students. While it's changed a lot over its 160 years, Columbia College has still maintained their ties with the Christian Church. Since opening, Columbia College has grown from a 2-year degree institution to a 4-year degree college with 35 campuses around the country. Along with its many in-person distance learning options, Columbia College also has an online campus, which offers a quick, affordable path toward a degree. Its online school offers 8-week courses with 6 sessions each year, meaning students can easily complete their studies in less than the traditional 4 years. However, students are also able to study at their own pace, since many of their online students are too busy to commute. There are 8 bachelor's degree programs offered through Columbia College's online school, some of which can be further specialized with a major or area of focus. Columbia also offers a flat tuition rate per credit, making it easy to budget for a bachelor's degree. Everything at Clear Creek Baptist Bible College is Christ-centered. Not only does this influence the academics at Clear Creek, but also the way the school treats students and its tuition costs. Their online program has the same flat-rate cost as their on campus tuition, as well as the same quality of education and student expectations. By doing this, there is no real difference between studying on campus or online- except that online students are able to study at their own pace and set their own schedule. The only bachelor's degree offered entirely online is their Bachelor of Arts in Ministry, a 120-credit-hour program that prepares students for a future career in ministry. Students can further specialize their education through elective courses, each of which is meant to teach real-life skills that graduates would use. Online courses are offered through the Sakai platform. Based in Kansas City, Missouri, Midwestern Baptist Theological Seminary is one of the top Christ-centered institutions in the region, basing its education off Methodist beliefs and values. Midwestern Baptist's online school is designed specifically for students who currently work in a ministry setting and don't want to or are unable to leave. With the flexibility of online learning, Midwestern Baptist brings its bachelor's degree programs to students, taught through the popular Canvas platform. Currently, there are 5 bachelor's degree programs offered, as well as special accelerated and fusion programs. The accelerated program lets students earn 2 bachelor's degrees online over 5 years of study while the fusion program allows students to spend their first year of school in the field. Courses in the online school last 8 weeks, and there are 7 different terms each year, allowing students to study continuously without needing to take on too much schoolwork at once. As one of the oldest colleges in Tennessee, Bethel University has a long-established reputation not just as a Christian college, but as an institution of higher learning. One of the only large changes Bethel has experienced in the past 175 years is the growth of its online programs, which often gain regional and national attention. 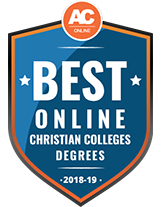 Because Bethel educates with Christianity in mind, all of its online degrees will pertain to Presbyterian ethics, teaching students their subject while also educating their spirit. While there are online bachelor's degrees offered that are related to Christianity (such as the bachelor's in Christian ministries), Bethel also offers a variety of degrees that lead to high-demand jobs. The online bachelor's degree programs are all completion programs, so students will need to have a minimum number of credits to be accepted. Prerequisites vary depending on the program, but incoming students should expect to already have at least 60 credits. The University of Mary is a Catholic, Benedictine college based in Bismarck, North Dakota. However, many of its students are nontraditional, which has led to the growth of its distance education program. The University of Mary has over 25 years of experience in distance education. The school currently offers 10 bachelor's degree programs that can be completed entirely online, and some through a hybrid of on-campus weeknight classes and online study (if students prefer that format). These programs are all designed for busy adults that want to further their career as soon as possible. To speed up their education, students are allowed to transfer credits into the program, and can even earn some college credits through previous work experience. Doing so can also save students money, reducing the already affordable online tuition costs. Some programs can be completed in as little as 15 months, although students are allowed to study at their own pace. Originally a Bible college for evangelists, Johnson University has expanded its academic offerings to include non-religious degrees. Regardless of what students choose to study, the curriculum reflects Johnson's Christian values, and it strives to educate students to become future leaders in the Christian community. To attract students, Johnson has made sure tuition is affordable, and has introduced an online school, increasing their reach and allowing students from around the world to earn a Christian education. There are 7 bachelor's degrees offered online. These are all 4-year programs that are designed to be completed entirely online. The curriculum for these online programs is the same as the on-campus equivalent, and online programs are held to the same academic standards. Along with the flexibility to study whenever they want, online students get access to an academic adviser and faculty. One of the only schools in the nation that offers all its academics solely online, Grace College of Divinity is a Christian school with a goal of educating and training adults interested in or are already working in a ministry. There are four 120-credit hour bachelor's degrees, all of which are designed to be completed in 4 years. Each of the programs is related to Christianity, but students can pursue specialized knowledge in areas such as Divinity, Christian Leadership, Intercultural Studies or Worship Ministry. Transfer students are also allowed into each program, as are students that have already earned an associate degree in a related field. Instead of educating students for traditional ministries, Heritage Christian University educates students for Real World Ministry- meaning graduates will be prepared for a life following in the footsteps of Jesus Christ. Online programs are the same degrees that are offered on campus, which for undergraduate students would only mean the Bachelor of Arts in Biblical studies. This 128-credit hour program is designed to be completed in 4 years, and upon earning their degree, students are prepared for a life of serving Christ. The majority of the curriculum is related to analyzing and understanding the Bible; however, other subjects, such as finance and history, are also covered. Most of the courses in this program are taught through prerecorded videos by the instructor, and all additional materials given to on campus students are provided to online students. This method ensured that online students are receiving the same education as on-campus students. Founded by Quaker settlers, Barclay College has been educating students on the Bible for over 100 years. Barclay College is a small school enrolling under 200 on-campus students, but their online offerings have been growing each year. There are 4 bachelor's degrees offered entirely online at Barclay College, all of which use the same core classes as the on-campus versions along with an additional 39?48 credits for the major. Two of the programs?the bachelor's in Biblical studies and the bachelor's in Christian leadership- are geared specifically toward students that are preparing for a future in the ministry. The other 2 bachelor's degrees, 1 in business management and the other in psychology, can still be applied to the ministry. However, because these programs are broader in their curriculum, students can take their careers outside of the ministry if they wish to do so. No matter which option students pick, they'll receive an education that is centered around the Bible. Technically a mix of 2 institutions, Grace College and Theological Seminary has been a global leader in Christian-focused education with graduates ending up around the world. All programs at Grace College, including its online programs, use what's called the Grace Core- a cluster of general education courses that gives students a well-rounded background. Aside from those courses, the classes that students take will depend on their chosen online degree. Grace College offers 6 bachelor's degrees online, 2 of which are degree completion programs that require previous school credit. All degrees include at least some Christian education, but some degrees are meant for students who are looking for a career outside their ministry. Regardless, students will have a faith-integrated education that can be applied to their professional lives. All of these programs are designed for adult learners that are currently employed or are unable to commute to campus. Siena Heights University is a Roman Catholic, private institution located in Adrian, Michigan. Online degree options at SHU include the Bachelor of Business Administration with concentrations in accounting, business administration, marketing and management, as well as degrees in multidisciplinary studies, nursing and professional communication. The degree in multidisciplinary studies is an excellent choice for incoming students who have previous academic credit in a variety of disciplines. Typically, students work with SHU advisors to compile credits from 4 different academic disciplines for this program: arts and humanities, natural science and math, social and behavioral sciences and applied science and professional studies. You must maintain a 2.0 GPA or higher to remain in good standing. In total, online students must complete 120?130 credit hours to graduate. Online courses are delivered in 8-week formats while some hybrid courses are 10 weeks in duration. As a distance learner, you will have access to numerous online and in-person resources including personal academic advising and degree planning, financial aid assistance, library services, and technical support. Graduates of this program go on to pursue a wide variety of careers in vastly different fields. Depending on how you configure your degree and focus area while at SHU, you can find yourself working in journalism, political science, public relations, education, human resources, among countless other career paths. Baptist College of Health Sciences offers several online and hybrid degree options for distance learners interested in majoring in an area of health studies. BCHS offers specialty health science degrees in the biomedical sciences, radiology, nursing, public health, pre-health studies, nuclear medicine and health administration. One of the only bachelor's degrees in public health available in the mid-south, the Bachelor of Health Science degree in Public Health prepares students to sit for the Certified Health Education Specialist (CHES) exam. BCHS graduates from this program go on to work in a variety of fields, including epidemiology, health education, community advocacy, public health and health administration. Courses are delivered both synchronously and asynchronously, depending on the class and its requirements. Most online bachelor's degrees at BCHS require approximately 120 credit hours for graduation. Since most of these degrees involve hands-on work with clients or patients in health care settings, most BCHS degrees require you to complete an in-person, supervised internship before graduation. For full-time students, these credits and requirements can be completed over the course of four years. Distance and hybrid learners have access to BCHS's Center for Academic Excellence, learning center, and library to make sure you get the most out of your degree and position yourself for the career you desire. You may transfer credit from previously attended, regionally accredited schools toward your degree at BCHS. While standards and requirements for each program will vary, you must have earned a "C" or better for a course to be considered by the registrar for transfer credit. You may also be able to earn credit for prior learning, which includes previous work experience, military training, and professional licensure or certifications. Online degree programs at Saint Leo University are designed to fit the unique needs of the adult learner. From business, accounting, criminal justice and health care management, you can find an online major that fits both your academic needs and schedule at this private Catholic institution. Less common online bachelor's degrees are also available at SLU, including sociology, religion and liberal studies. Distance learners majoring in psychology investigate human experience through SLU's various specialty courses, like abnormal, forensic and military psychology. Psychology graduates secure employment as case workers, social workers, counselors, occupational therapists and can even work in advertising. Like most of the online bachelor's degrees at SLU, you must earn 120 credit hours for graduation. SLU offers online learners the chance to build a community and social network via virtual student clubs and organizations. You will also have access to academic counseling and career services to set goals, plan ahead, and get the most out of your online degree. Transfer credits from a regionally accredited institution may be accepted and are evaluated by the registrar on a case-by-case basis. For students 22 years of age or older, North Greenfield University offers online bachelor's degrees in business and leadership, criminal justice, education, general students and psychology. Founded in 1891, this private Christian college is affiliated with the Southern Baptist Convention. Adult distance learners can take advantage of NGU's history of Christian education by earning an online degree in Christian ministries. For this major, students choose between concentrations in Biblical students, ministry, theology and youth ministry. You will acquire a solid foundation in theology and its practical application to daily life and ministry. NGU graduates seek out careers in churches and religious organizations as missionaries, nonprofit leaders, pastors, and church educators. As with most bachelor's degree programs, this degree requires approximately 120 credit hours to graduate over the course of 4 years. While transfer credits may be accepted on a case-by-case basis, a minimum of 25 percent of your course credits must be earned at NGU. Chaminade University of Honolulu is a private, co-educational institution and is affiliated with the Roman Catholic Church. From business administration and criminal justice to political studies and liberal arts, you can earn your bachelor's degree from Chaminade entirely online. Distance learners can also earn a BA degree in religious studies. This degree program is grounded in Catholic theology and Marianist educational philosophy and explores the meaning of faith from a multicultural perspective. With this degree, most graduates move on to be active members of the church community as pastors, educators, and project organizers. This degree also prepares you to pursue graduate education in religion or related field. Most online degrees require students to earn a total of approximately 120 credit hours. Students must also complete a capstone project during their senior year. For full-time students, this usually takes 4 years including summer semesters. For general admission, transfer students with less than 24 college credits must submit their ACT or SAT test scores as well as all official school transcripts. Transfer credits may be accepted toward your online degree and are evaluated by a Chaminade enrollment specialist when you apply. You may ask for an unofficial credit evaluation before sending in your application. As a distance learner, you will have a personal advisor to help you plan your degree trajectory and register for courses each semester. Online students can earn bachelor's degrees in organizational leadership, business administration and network management at Southern Nazarene University. Established in 1899, this private school boasts an online program that offers business administration majors the chance to explore the financial and managerial aspects of business, going beyond business theory and into practical applications that you will need in your professional career. The program is designed for students who have earned 60 or more transferable college credits. Classes meet one night a week for 15 months at the Bethany or Tulsa campuses or can be completed entirely online. SNU offers a bridge program to help you meet the 60 college credit hours needed to enter these degree completion programs. The bridge program is only available at the Bethany and Tulsa campuses. You must have at least 12 transferable credit hours and be 23 years of age or older to enter the program. All SNU students have access to the Center for Student Success and Center for Global Engagement. Each office will help you stay on track to complete your degree on time as well as provide opportunities to engage with off campus academic programs that equip Christians to serve others in an expanding culture and economy. Located in Clinton, Mississippi College is a private Baptist-affiliated institution that offers several Bachelor of Science degrees and certificates entirely online or in a hybrid format. You can earn degrees in business administration, communication, paralegal studies, nursing, homeland security and loss prevention or certificates in homeland security and loss prevention. Both the business administration and communication degrees are intense accelerated programs. MC's RN to BSN boasts a 12-month, faith-based program that prepares nurses to expand their patient-centered career options. Those who graduate from this program move on to careers in health care centers, hospitals, clinics, community organizations and schools. A total of 30 credits are needed for graduation and may be completed at your own pace. For this major, applicants should have a minimum GPA of 2.0 and must submit their official transcripts from previously attended institutions. You must also possess a current unrestricted registered nurse license in your state of residence and pass a criminal background check. All distance learners have access to the office of student success and counseling center for academic counseling and help meeting their educational goals. You will also have access to MC's career services office, writing center and many of the main library's online books, articles and subject guides. Established in 1944, Lincoln Christian University is a small Christian institution affiliated with the Churches of Christ. Distance learners can earn their bachelor's degree in business administration, Christian ministry or Psychology entirely online or in a hybrid format. The online bachelor's degree in Christian ministry is ideal for students interested in pursuing careers in ministry, mission work or education as an associate, administrative or discipleship pastor and church group leader. Online students will learn how to prepare a sermon, preach, teach Sunday school classes and develop a personal philosophy of ministry. LCU offers student development services to help students build healthy relationships, foster spiritual growth, develop personal and professional skills, and make their way toward a fulfilling graduation. Hybrid students can also take advantage of on campus student organizations, including choral singing groups, student government, and a student chapter of the American Association of Christian Counselors. Prospective distance learners must complete an online application, including an essay and personal character reference. Transfer students may apply previously earned college credits toward their LCU degree and have a cumulative college GPA of 2.5 or higher. The registrar's office evaluates transfer students' transcripts to determine which credits are transferable. Applicants coming out of high school should have a minimum GPA of 3.0. Each bachelor's degree at LCU requires 120 credit hours for graduation. As a distance learner, you should plan on taking at least 12 credits per semester. Online courses are split into 2 8-week sessions. Full-time students usually take 2 courses per 8-week session and graduate in 10 semesters. Freed-Hardeman University is a private university in Henderson, Tennessee, established in 1869, and is associated with the Churches of Christ. As a distance learner, you can work toward your undergraduate degree taking hybrid courses that focus on Bible studies, education, the behavioral sciences and business. As a Christian university, the College of Biblical Studies strives to prepare its students for careers in ministry. Graduates of this program go on to serve church congregations as pulpit ministers in all 50 states and many countries. FHU students also study to be Christian missionaries and youth ministers. Both the BA and BS in Bible require approximately of 126 semester hours to graduate. Those online students interested in local ministry or pursuing a graduate education should apply for the BA degree. The BS is designed for students interested in local ministry, including positions with the pulpit, church education, and church counseling. All full-time distance and hybrid learners should plan to spend four years working toward their degree. In addition to having access to FHU's extensive online library resources, distance learners also utilize the iLearn platform for collaborative student learning and video conferencing. FHU is dedicated to having updated web-based, technology enhanced techniques for all traditional and nontraditional students. Located in Searcy, Arkansas, Harding University is the largest private liberal arts institution in the state and is associated with the Churches of Christ. Beginning in the 2018 fall semester, Harding's distance education program will offer a fully online Bachelor of Arts in Bible and Ministry. This degree program is designed for adult learners, ages 24 and older. In this accelerated program, distance learners take 2 or 3 classes at a time. Students can finish this 2-plus-2 liberal arts degree in as little as 2 years. Graduates go on to work in various roles in churches, schools and faith-based organizations and nonprofits. Online students also have access to resources such as academic coaching and counseling, tutoring and student-led supplemental instruction sessions. Online students pay the same tuition cost per credit as their traditional on-campus peers. Academic and need-based scholarships are available as well as tuition discounts for Christian missionaries, K?12 teachers in Christian schools, orphaned children and unmarried dependents of full-time Church of Christ ministers. Arizona State University is the largest public university in the United States with more than 80,000 students. ASU offers over 800 programs from bachelors through post-doctoral degrees. More than 150 of these degrees are available 100% online. You can earn the exact same degree as you would attending ASU in person but with the added flexibility of learning on your schedule. Grand Canyon University is a private, Christian University with more than 100 bachelor’s, associate’s, master’s and doctoral online degrees. Liberty University equips men and women with the values, knowledge, and skills essential for success in every aspect of life through a world-class education with a Christian Foundation. Colleges with religious affiliations can be found throughout the United States. In 2013, 970 faith-based institutions received regional or national accreditation, 570 of which were Christian, according to the Department of Education. This includes Catholic, Baptist, Methodist and Presbyterian schools, among a handful of others. In addition to denomination, many Christian colleges vary by level of religious focus. For example, some Christian institutions boast academic environments with strong dedication to a faith-based curriculum. These institutions often use Scripture as a backbone for lessons and coursework, and require students to take classes on the Old Testament and New Testament. Students may also participate in ministry work locally or overseas, or work toward an actual career in the ministry. A master’s degree in divinity serves as the staple here, taking an estimated two years to complete. Other Christian colleges have a more relaxed approach, remaining tied to the church but offering a more secular education. These Christian colleges tend to have strong liberal arts foundations that lead to a wide range of degree program options. Also, despite relatively loose affiliation with the church, they often have faith-based clubs and support groups for students and faculty. Similar to secular institutions, many Christian colleges have prioritized distance learning via new courses, full-fledged degree programs, support services and a revamped technological infrastructure. More courses, programs and degrees available online means increased diversity and happiness among the student body. Online learning maximizes flexibility, allowing degree seekers with family, job or other important commitments to work toward graduation without neglecting elsewhere. This is especially true of asynchronous, or self-paced, online programs. Here students listen to or watch pre-recorded lectures, submit assignments and take exams on their own time. This could be a day, a week or a month after the live event. Many self-paced programs, however, do come with some deadlines to ensure students move forward. In contrast, synchronous programs call for regular student activity and attention. Participants may need to log on at preset dates to chat with professors and peers in real-time. They may also be required to take timed exams or engage in group discussions or projects on a set schedule. These courses still offer great flexibility, but also promote collaboration. Online Christian colleges offer a unique approach to higher learning. They are committed to developing Christ-centered adults who impact the world in positive ways. Through a variety of learning formats, students learn important biblical principles that they can take back to their homes, workplaces and communities. At Christian colleges, students and faculty connect through a shared faith, whether they attend classes on campus or online. Requirements vary widely among Christian colleges. Although church attendance is not mandatory at some institutions, other schools require students to attend church regularly, even in an online program. Some online Christian colleges offer students in distance learning programs the chance to connect spiritually via the web. Resources often include prayer and counseling through a dedicated forum. Students in distance learning programs at some Christian colleges can earn credit for volunteering and social activism. The best to truly understand how a college’s distance learning works is to ask. Affordable Colleges Online asked C. Michael Perry, an admissions counselor at Christian Brothers University, to explain how the school’s Christian component works with online learning. Are online students at Christian Brothers University required to receive the same instruction in Catholic doctrine and practice as on-campus students? While CBU was founded as a Catholic school, the student body is quite religiously and culturally diverse. Catholic studies are not a requirement, and there is no instruction in Catholic doctrine outside of certain Religious Studies courses. However, students who live on campus have opportunities to participate in faith-based programs such as bible study groups, prayer events and service activities. For example, we have a tutoring program with Blesses Sacrament and Holy Names Schools and our students work with St. Mary’s Soup Kitchen. Is the material in the online courses at Christian Brothers University similar to the material in traditional on-campus courses? Our students receive the same academic material regardless of the course being offered online, in a hybrid format, or completely on campus. Currently only a select group of courses are offered completely online, although we have quite a few hybrid courses, especially within the College of Adult Professional Studies. As the popularity of those courses increases, there is the possibility of expansion. Please describe the value of your online courses in comparison to on-campus courses. The hybrid format allows for flexibility. It blends face-to-face time with the school’s faculty and other students, with the freedom to complete coursework online. In our hybrid courses, we utilize online lectures and discussions in addition to campus classes. Hearing from administrators of online programs at Christian colleges means more detail and insight into the mindset and resources that fuel online learning. However, to cultivate a more well rounded point of view, AC Online reached out to Anna G., an undergraduate student at Liberty University Online. What made you choose the online program at Liberty University? When I first graduated from high school I looked at different Christian colleges because my faith is really important to who I am. But I ended up working full-time for a few years before I was ready to commit to earning a degree. Scheduling classes around a full-time job is difficult, so I thought taking classes online would be a good way to work around my schedule. And it has been. Plus I still get the benefit of being in a Christian environment. The faculty is Christian, the other students are Christian. The perspective is just what I was looking for. What does Liberty University offer in terms of faith-based services for online students? Obviously it is a little different because when you don’t live on campus or take classes there every day, you aren’t able to take part in the same activities. But if you go to Online Communities on the website, you can connect through live streams, bible studies, and that kind of thing. People post their testimonies, sign up for public service. Basically anything you would do on campus is there in a virtual environment. What type of academic support do you receive through Liberty University Online? I have always felt supported by the school academically. For example, I have gotten help through Tutor.com when I’ve needed it. Any time I have a question I can reach my professors online and they get back to me right away. My advisor has also been really helpful. I have always been able to find what I need when I need it.